I am in love with this illustration. It has the impressionist spirit which I love, the instant glimpse, the momentary feeling of beauty of the world. I readily recognise the heavy sun of late winter afternoon and dry grasses covered in frost; they give a crackling sound as you walk. The coy looking fox is as familiar and casual as your neighbours' dog. The dear world of childhood where every animal is your friend, and every walk is an adventure. 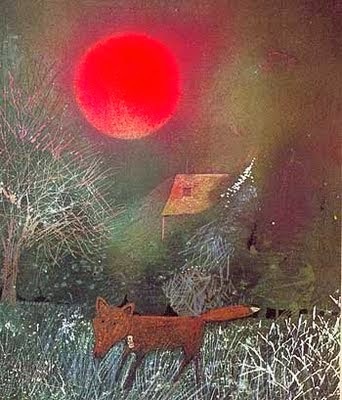 It is by English illustrator John Burningham and comes from his book "Seasons" published in 1971, I found it here.